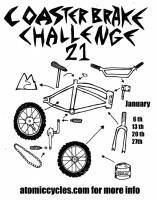 Coaster Brake Challenge is a mtb off road rally series where you can ride a bike armed only with a coaster brake. No gears, multi-speed internal hubs or additional hand or other kinds of brakes allowed. This event has been going on for over 10 years now and has a good turn out of 20-30 people, new blood is what we\\\'re seeking perhaps you\\\'ve heard if it. If you like fun, amazing positive attitudes, and single speed mountain biking, this may be for you. 20.00 entry fee gets you a t-shirt, a patch and 4 rallies with food and prizes at the last run. Meet points are located on my website (see flyer pic for that info) as well as all you\\\'ll need to know to give it a shot. I have loaner bikes that you can use upon request. Hope to see you then! Fire road loop with a little paved section about 1/2 a block. Some good downhill and some beast climbs, you have to do it twice hence the name of the course. 10-12 miles or so.